Has your employer failed to pay your earned wage or commission? Were you terminated or did you quit your job, and as a result, your employer has told you that it is not going to pay you your last paycheck? Were you terminated your employment in retaliation for not being paid your earned wages? If so, our New Jersey Employment Lawyers may be able to help you recover your unpaid earned money. New Jersey has enacted the Wage Payment Law in order to assure that employees are timely paid their agreed upon wages for the work they perform for their employers. 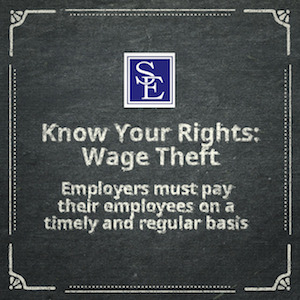 The New Jersey Wage Payment Law is a humanitarian and remedial legislation that our courts have stated should be construed liberally in favor of the employee receiving their wages. must provide employees advance notice who are paid on a commission basis of any change in the method by which the commission is calculated. New Jersey courts have made clear that an employee can maintain a private cause of action for an alleged violation of the New Jersey Wage Payment Law. If you believe you have not been paid your earned wages or commissions, please call our office to speak to one of our New Jersey Employment Lawyers about your claim of unpaid wages.